It’s that time of the year, where American football dominates pretty much everything round here. I mean, we aren’t the biggest football fans, but we live in New England. Whether you love the New England Patriots or hate ’em, you have to admit they are an amazing team. I’m a Chicago Bears fan, and after so many absolutely horrific seasons, I’m still loyal to my home team, but I have to give it up for the Patriots. Having said that, we are still in the middle of playoffs. Who knows who’ll make it to the Super Bowl, but what I can tell you is that many of us will be spending the next few weekends wrapped up in all things football. And that includes entertaining and cooking. Our next few weekends are booked with brunches and dinners with friends, and I can guarantee that the game (whichever game it is) will be on, and it will be front and center. So, in that spirit, I wanted to make a football themed dessert. I decided on cupcakes because who doesn’t like cupcakes? And going along with that same thinking, I wanted to make the ever popular chocolate cupcakes. This particular recipe for chocolate cupcakes is a new one from me. It includes all of my favorites in a chocolate cupcake recipe – it’s made with oil, milk, and coffee. I know some recipes say that adding the coffee is optional, but if you want that little chocolate cake to have some depth of flavor, the coffee is a must. Another important reason the coffee is a must, is that it provides the acid in the batter, and since my recipe uses baking soda as the leavener, an acidic component is necessary for the proper crumb and texture for the cupcakes. From the get go I knew I wanted to plop a big-old football on the cupcake. But what I needed to figure out was what kind of football – a sugar cookie football, a royal icing football, a candy melt football, or a cake pop one. Since I wanted the football to have dimension and substance, a cake pop was the obvious choice. Plus, making the cake pop was such a breeze because I just used the extra cupcakes to make my footballs rather than having to make a batch of sugar cookies or royal icing just for the cupcake topping. 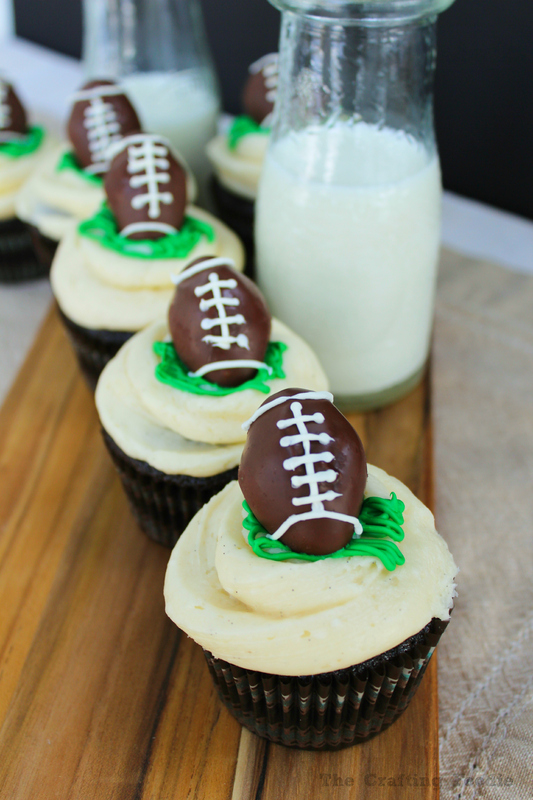 So really this football themed dessert is really two treats in one – a moist, rich, cupcake and a dense, chocolatey cake pop all in one adorable, football package! The cupcake recipe below will yield 24 cupcakes. I used 6 of the cupcakes for the cake pops, resulting in 18 cupcakes and 18 cake pops. For the cupcakes: Preheat the oven to 350 degrees F. Line a muffin tin with paper wrappers. Allow the cupcakes to cool in the pan for about 15 minutes. Then remove them from the pan and allow them to cool completely on a cooling rack. For the vanilla frosting: Cream the butter and confectioner's sugar in the bowl of a mixer fitted with a paddle attachment. Set about a scant ¼ of the frosting aside for the cake pops. For the cake pops: Once the cupcakes are completely cool, crumble 6 of the cupcakes into fine crumbs. Mix in about 2 tbs of frosting. The resulting mix should be malleable and soft, like play-doh. 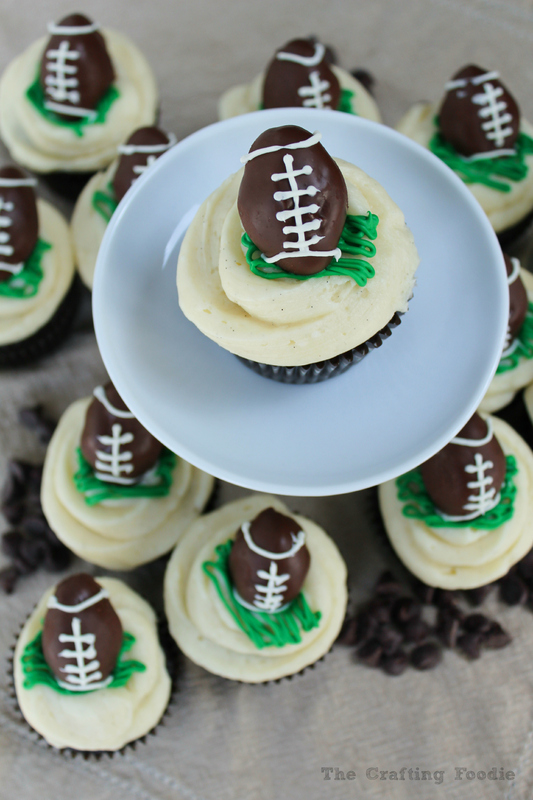 Using about 1 tsp of cake pop mix, form the cake pops into a football shape. Place on a parchment lined cookie sheet and chill for at least an hour. When the cake pops are thoroughly chilled, melt the chopped chocolate and shortening. Using a toothpick, dip the cake pops in the chocolate. Gently shake off extra chocolate. Place the cake pops back onto the cookie sheet and cool completely. While the cake pops cool, frost the cupcakes. Once the cake pops are completely cool, place the extra frosting in a piping bag and pipe the football details on each of the cake pops. Tint any left over frosting green. Place in a piping bag, and pipe lines in the middle of the cupcake. 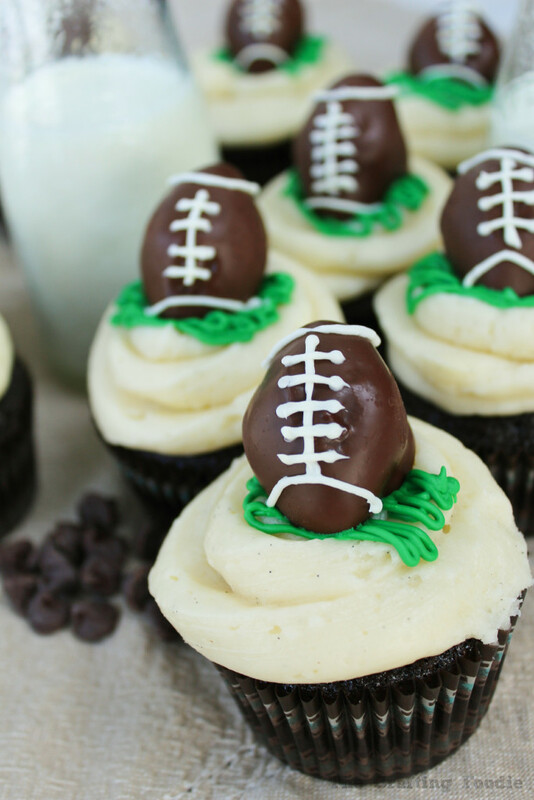 Finally, place one football cake pop on top of each cupcake. So cute! I love that the footballs are cake pops. They look so realistic! Thanks Beth! I’ve seen all the adorable treats you’ve been posting the entire week. They are all so adorable (and they look pretty delicious, too!). Thanks so much Aimee! 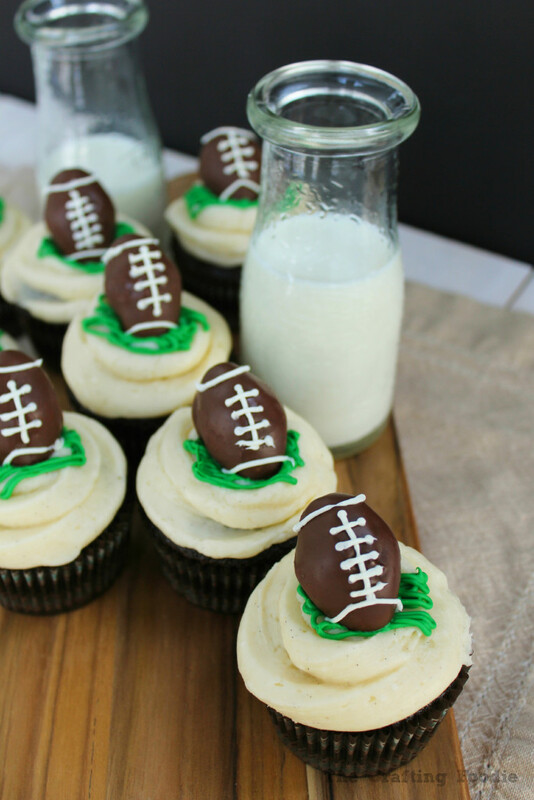 They’re pretty delicious, plus, who can resist a mini-edible football? These are adorable. Sharing now! What an absolutely fun cupcake for tail gating!!!! These are so cute!!! Thanks so much Jocelyn! My kids LOVED them! These are really cute. Look delicious too! Would love for you to share your link with our readers. We love crafters and foodies! Hope your team made it through. Thanks, Lisa! My team is the Chicago Bears (and they never win anything), but we live in New England and my kids love the Patriots. So they’re excited, and football is still going strong around here 🙂 I’ll definitely check out your site. Thanks so much for stopping by! Definitely try these! They’re so easy and kids LOVE them (especially football loving ones). Hope you and your family enjoy the rest of football season! These are SUPER cute, Aida! I love them – so creative! Thanks so much, Sara! 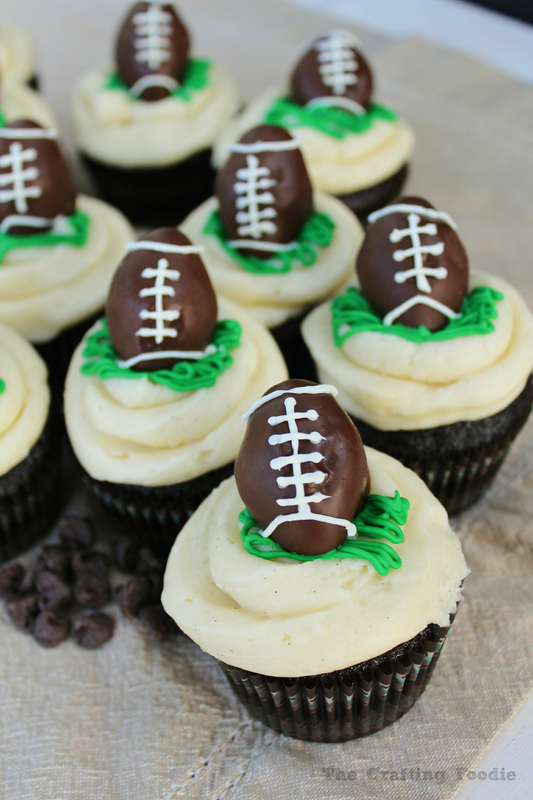 They’re perfect for football season!